Greece is a haven. It is a country with limitless number of tourist attractions and things to do for almost every type of traveler. If you are looking to visit this beautiful country, you must be interested in knowing the top things to do while visiting Greece. This list of top things to do in Greece will help you plan your trip and have best out of your Greece trip. Greece has over 3,000 islands and only about 130 of these islands are inhabited. Because of this, one of the best things to do in Greece is island hopping. The Cyclades Islands is one of the best options since each of the islands proudly presents stunning scenery with distinctive characteristics. Other popular island destinations include; Rhodes, Santorini, Mykonos, Crete, Corfu, Paros, Ios, and Hydra. Santorini is one of the most visited Greek islands and it if you have enough time in your hands, you may want to try staying here longer. It is a beautiful and scenic volcanic island and is often called as the ‘precious gem of the Aegean’ and considered as one of earth’s most romantic destinations. It offers tranquil cliff-top towns, magnificent sunsets and glorious volcanic beaches adorned with black, red or white sand. 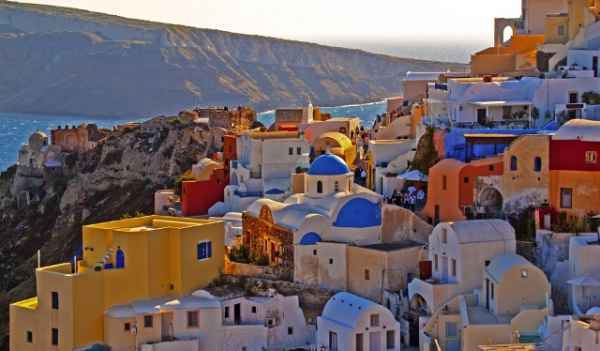 So, without any doubt, visiting the stunning Santorini is surely one of the best things to do in Greece. Ancient Athens is the place to be if you want to learn more about ancient Greek history and culture. When you pay a visit to this place, it will feel like you are stepping back in time. The city’s significance to history dates back to the 5th century BC when the first community settled here. Its rich culture was developed through the years by the marks left by different cultures that conquered it. The center of the city was turned into a pedestrian zone that leads to the popular archeological park where visitors can enjoy the magnificence of Acropolis. Therefore, visiting the major historical attractions in Greece surely is one of the top things to do in Greece. What can be more relaxing than to be in a place that is peaceful and tranquil? The Athens’ National Garden (formerly called Royal Garden) is the best place to go if you fancy a quick escape from the busy city. This lush, serene oasis covers about 15.5 hectares of beautiful area right at the back of the Greek Parliament building. The park also boasts of a botanical museum and a small zoo. If hiking is your thing, a visit to Crete is a must if you are going on a Greek vacation. Even if you are not an experienced hiker, you will still love walking through the gorgeous Samaria Gorge. This canyon is Europe’s longest at 10 miles and it passed through pine forests, mountains and cheer cliffs. Despite the usual crowd – over 170, 000 hikers/walkers try the gorge every year – your hike through this breathtaking canyon is surely going to be an adventure to remember, making it one of the best things to do in Greece for adventure lovers. Greece is also very proud of its idyllic beaches and beach hopping is certainly a great activity to engage into. Myrtos Beach stands out for its sheer splendor and magnificent blue waters. Another beach that should be on the list is the Ornos Beach (Mykonos), because it is easily accessible and perfectly lined with ancient concrete buildings and tavernas. Other beaches that you should check out include; Paradise Beach, Red Beach, Banana Beach and Sweetwater Beach. No one can leave out this activity from any list of top things to do in Greece. Visiting Lindos, an ancient village on Rhodes, gives visitors that chance to go through a wonderful experience by walking through a labyrinth of whitewashed houses and cobbled streets. The village nestles peacefully at the bottom of a steep rock and it’s magnificently bordered by the sea. At the top of the rock is the Acropolis that proudly overlooks the archipelago and protects the village below as the Lindos Eye. The beauty of this village makes a visit to Lindos one of the must things to do in Greece for every tourist. It is very common for people traveling to Greece to visit Athens; after all, it is the most visited place in the country. But the Northern part of Greece, which is usually skipped and ignored, should also be on your list of things to do in Greece. Northern Greece was home to Alexander the Great, and that fact only should entice many visitors. This region offers Mount Olympus, Mount Athos and Thessaloniki. Northern Greece, to history and nature lovers, means paradise, great Byzantine ruins, and lovely and less crowded beaches. Greece is named as the newest wine country in Europe and for good reasons. You can book for a private wine tour that will take you to the beautiful Santorini countryside. The guided tour usually takes guests to three wineries and includes: lesson in wine-making; tasting of at least a dozen different Santorini wine varieties; sampling of the best local cheese, olives and salami; and tasting of local beer at the Yellow Donkey. For wine lovers, tasting many different varieties of wines is one of the must things to do in Greece. Climbing up to the Greek Gods’ is tremendously atmospheric and definitely a worthwhile challenge for anyone. Each year thousands of tourists (local and foreign) visit Mount Olympus to enjoy the beauty of its nature, to explore its slopes, and to accomplish reaching its peaks. There are organized mountain sanctuaries and a variety of climbing and mountaineering routes that are available to guests, who wish to explore the area. Mytras is a magical ghost town in Mount Taygetos close to the ancient city of Sparta. This fortified town provides visitors with a time capsule as it allows them to magically step to the long lost Byzantine age. During the 14th century and the 15th century, Mythras served as Byzantine capital and it was during that time when it prospered well. Today, the site is known as the new Sparti town. Greece is an ideal windsurfing destination and Windsurfing must be one of the top things to do in Greece. The flat shallow water and the constant wind allow for different windsurfing levels. Two of the most popular windsurfing spots in Greece are Artemis and Paros. According to windsurfing aficionados, the quality of waves on these two islands is just unmatchable. Other windsurfing destinations you may want to try may include; Vasiliki, Naxos and Andhros. If you want to stay in the city and relax the modern way, your best option is to enter the upscale neighborhood of Kolonaki. This district is known to Greeks as central Athens’ posh area and it is home to the town’s rich and famous. The district boasts of foreign embassies, prominent schools (The British School and the American School), chic fashion boutiques, and the city’s most fashionable restaurants, bars and cafes.